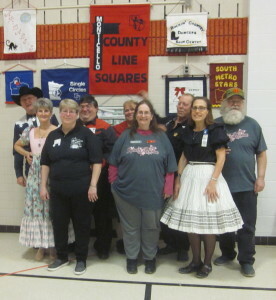 March 29, 2019 – County Line Squares “Alzheimer’s Benefit” Square Dance, Monticello, Caller Abe Maier, Cuer Ken LaBau. 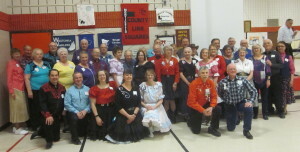 Dancers from Afternoon Squares, Ar-Dale Dancers, Beaux & Belles, Cambridge Corners, Crystal Cross Trailers, Dakota Grand Squares, Hot Foot Stompers, Jolly Twirlers, Koronis Nite Owls, Rockin’ Country Dancers, Single Circles, South Metro Stars, Spares & Pairs, TMF Squares, Triple T, Wadena Whirlaways, and Westonka Whirlers joined County Line Squares to raise $2,060 for donation to Alzheimer’s Association Minnesota-North Dakota. 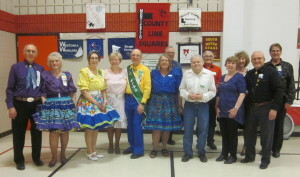 Those attending the dance included Cambridge Corners King Arnie and Queen Edna, Hot Foot Stompers Queen Coni, Jolly Promenaders Queen Cindy and King Dan, Spares & Pairs Queen Jennifer and King Barry, County Line Squares Queen Gael and King Doug, RoundUp Editors Jeanine and Bob Maiden, RoundUp Advertising Manager Connie Walker-Pearson, RoundUp Business Managers Cindy and Dan Hoffman, RoundUp Subscription Manager and Enhancin’ Dancin’ Editor Paul Pearson, Callers Mike Driscoll and Bob Maiden, Square Dance Minnesota (SDM) Vice Chair Barry Downs, SDM Treasurer Gael Zachman, SDM Executive Director LeRoy Elfmann, SDM Historian Al Martin, SDM Marketing Director Dee Scott, and SDM Membership Director Mary Kay Amberg. Cambridge Corners and Triple T claimed County Line Squares banenrs. 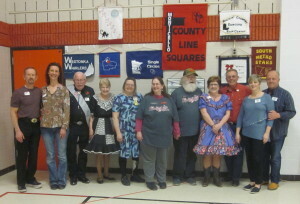 Spares & Pairs and Koronis Nite Owls already have a County Line Squares banner. 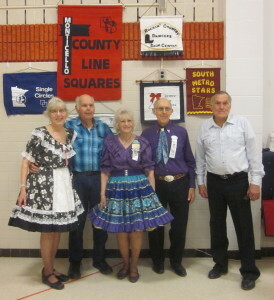 Beaux & Belles, Rockin’ Country Dancers, and Westonka Whirlers retrieved their banners. 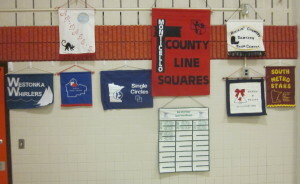 Spares & Pairs already had a County Line Squares banner. 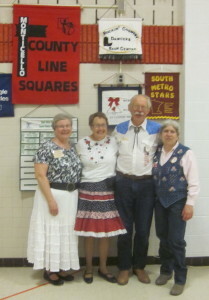 Koronis Nite Owls (Jolly Twirlers support) already had a County Line Squares banner. 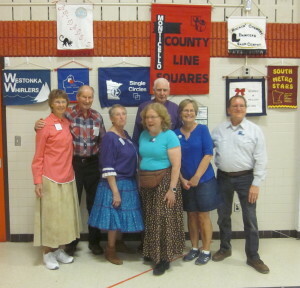 Cambridge Corners claimed a County Line Squares banner. 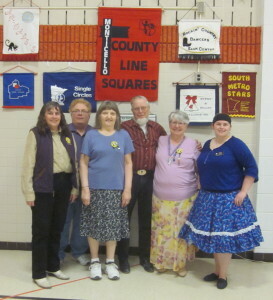 Triple T claimed a County Line Squares banner. Rockin’ Country Dancers retrieved their banner. Westonka Whirlers retrieved their banner. Single Circles retrieved their banner. 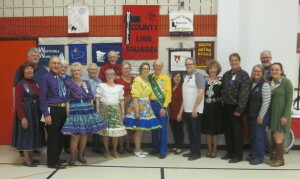 Some of the Hot Foot Stompers dancers present. 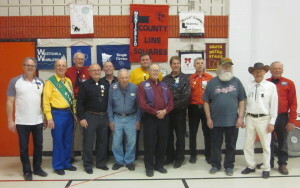 Most of the County Line Squares members present.